Here at MRB Workshop Services, we have been providing commercial garage equipment to car manufacturers across the country for over 25years. With our unrivalled knowledge of the industry and high quality equipment, we have become the first choice as suppliers for many high-end companies. 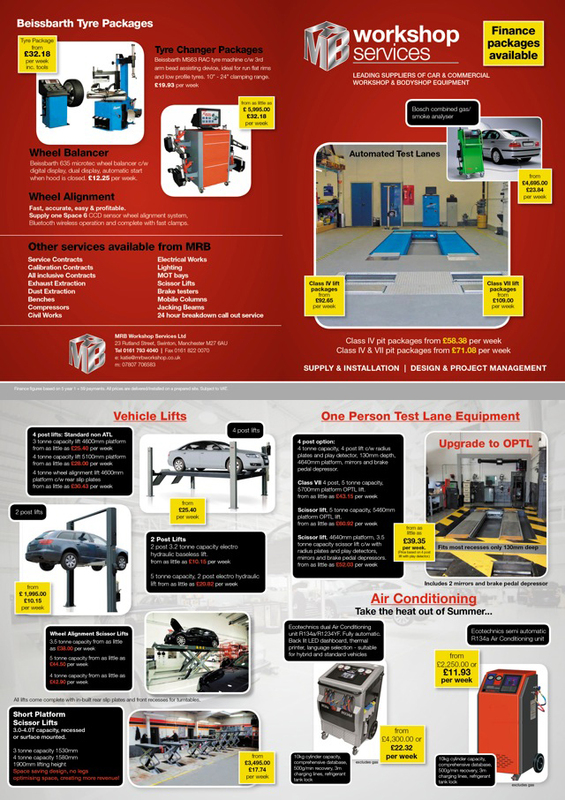 Whether you are in need of MOT equipment, two and four post car lifts, wheel alignment systems or brake testers, we supply a wide variety of specialist garage equipment to help you when assisting your customers. We pride ourselves in our customer service which is why we offer products manufactured by the best brands at competitive prices. Whether you want to service or redevelop existing equipment, or are looking to expand your site, we can provide you with the best machinery on the market to ensure that you can meet your customers’ needs to the highest standard. Having gained an outstanding reputation within the industry, we have had the opportunity to supply garage equipment to many prestigious brands such as BMW, Ford and Mercedes-Benz. If you would like more information about the products that we sell, or would like a quote for our services, do not hesitate to contact us on 01617 934 040.